4276 Likes? I am so speechless and so humble for your kind support Shihan Essence! Thank you for what you do - keep bringing the light and spirit of Martial Arts to the world as one of good source of positive energy. 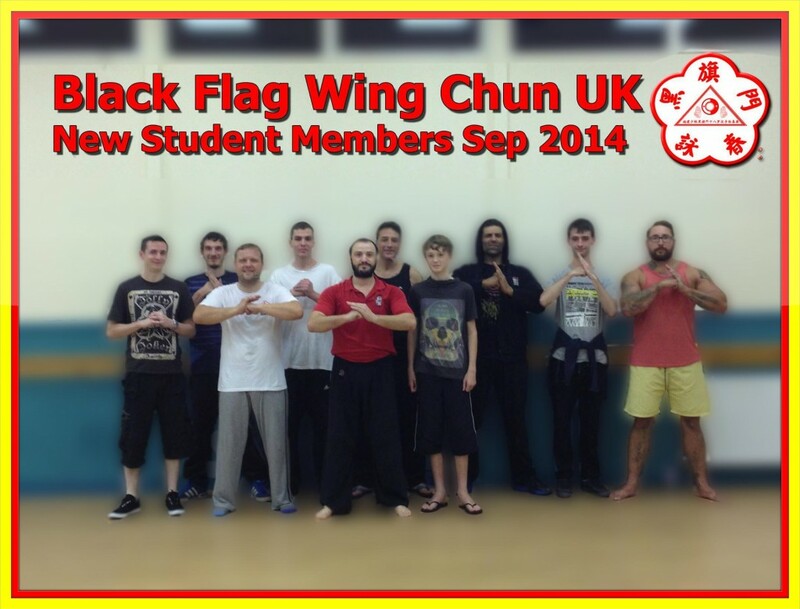 New HKB Black Flag Wing Chun Instructor Candidates/Group Leader for Texas. Subject: New HKB Wing Chun Instructor Candidates/Group Leader for Texas. 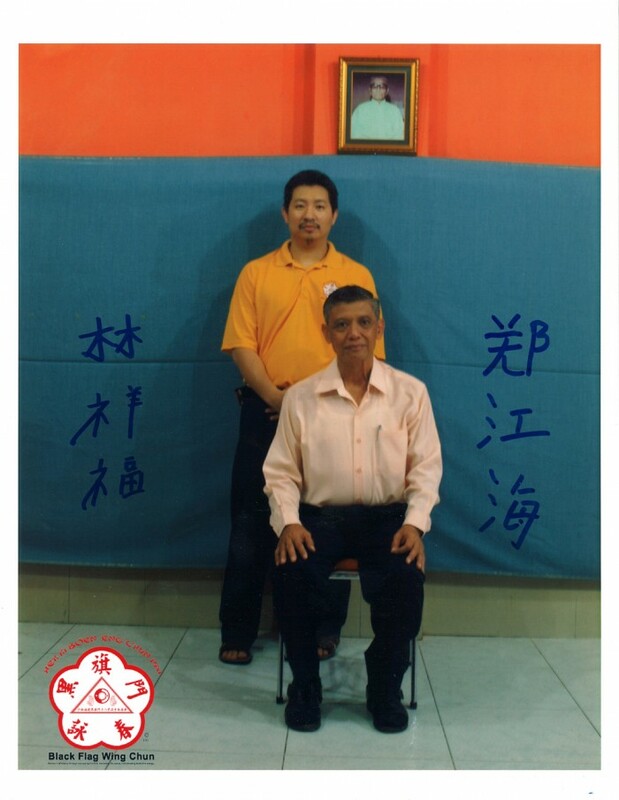 After long process of selection and consideration, I am proudly to announce that we have a new addition to International HKB Wing Chun Leadership. Convinced by their strong commitment and ability to train hard and lead, I have decided to accept Drew Miles and Johnathan Miles into the HKB / Black Flag Wing Chun Instructor Program. 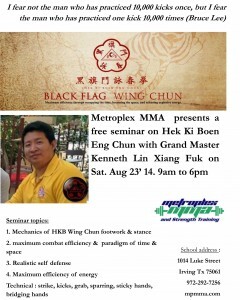 As of today, they are also acting as the Group Leader and Official Representative of HKB Wing Chun for TEXAS. 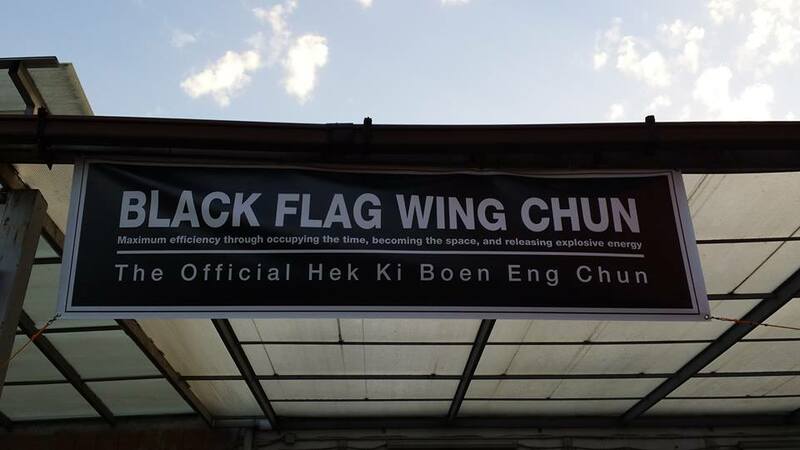 Let it be known that they are the ONLY Official Representative for Black Flag Wing Chun for Texas. To all of HKB Leaders, Instructors, Assistant Instructors, Group Leaders and Student Members, Please join me CONGRATULATING Drew Miles and Johnathan Miles to for their recent acceptance into HKB Wing Chun Instructor Program by posting your Comments, Likes and Shares. 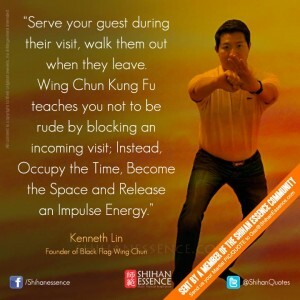 By: Sifu Kenneth Lin, Edited by John M.
I frequently hear students tell me that they don't have enough time to train. Let me share with you why this doesn't have to be the case and to give you a couple of secrets to overcome this self-imposed limitation.It was a Friday evening and several students had come to the studio for one of our make up classes. We had an excellent class and the students that had come were excited that they had made so much progress because of the attention each student was able to receive due to their only be a handful of them that evening. I frequently hear students tell me that they don't have enough time to train. Let me share with you why this doesn't have to be the case and to give you a couple of secrets to overcome this self-imposed limitation. It was a Friday evening and several students had come to the studio for one of our make up classes. We had an excellent class and the students that had come were excited that they had made so much progress because of the attention each student was able to receive due to their only be a handful of them that evening. At the end of the class we were discussing some technical issues when one of my students remarked that he was grateful there weren't too many people in that class. It was at that moment that I told them that I was a bit sad that so many students were not coming as much as they could because they did not have time. We all know that times have changed and people are working longer or even working two jobs. They have limited time for training. Most of us have job and family obligations that take up much of our time. The students were nodding in agreement that it is hard to train as much as we would like. Kung Fu is not the name of a martial art. It really means the hard work that goes into perfecting oneself in the pursuit of his art. Kung Fu does not only apply to martial arts. It applies to any effort that require immense commitment, hard work, and of course, time. So one of my students asked, "How do you make time to train?" I then related to them my own history of "not having a enough time to train." Many years ago, I was still a store manager of a large electronics chain store, one year before I was promoted as a district manager. My day started at 7 AM and ended late in the evening around 10 PM. I had to be on premise most of that time. At the same time, I was also growing our HKB Wing Chun system and had to keep up my skills. So how did I make the time? To be honest, I had to "steal" time from my employer. By "steal" I mean I took about 5 minutes every hour to find a private and secure place in the store. This happened to be a my office or sometime even restroom! I would ask one of my assistant managers to watch the floor and take care of business. I would then sneak down to my training area and lock the door behind me. Once there, I would practice one of the Wing Chun techniques [Hand/Leg Techniques/Footwork, etc] over and over. Let's just say that to perfect one's punch, you need to punch 300,000 times. That's a lot of punching. But if you take five minutes, you will find that you can punch at least 200 times. If you practice six or seven times a day you have just completed 1200 punches for that day. In 250 days, you can reach your goal. Realistically, you won't train every day like this so you might expect you reach your goal of 300,000 punches in a year or so. That isn't so bad and is certainly less than the lifetime of work you might have been expecting. Naturally, our Wing Chun has hundreds of techniques to learn and master but none the less, you can make significant progress in your training even if you "don't have enough time to train." It is a human trait, that we always make time for things that matter the most to us. If you like to dine out you will make time to go to a restaurant. If you like to ski, you will make time to get away for the day. If you like to watch a certain TV show, you will make time ( either you will carve out that time slot or you will record it and watch it when you do have some extra time). Which brings me to my next point. You may be sabotaging yourself my trying to be a perfectionist. What do I mean? You may think that "I need to practice one hour every day of the week." When that becomes impossible or unreasonable because of other life priority, you may just give up. My suggestion to you is this. Tell yourself that you will train for ONLY 5 minutes a day or even every other day. Yep, just five minutes. Go to a place where you can train privately and just start. Give yourself a simple goal such as "I am going to practice my Im punch for 5 minutes and call it a day." What happens of course is that as you start to train, you have a very doable goal and you will complete it very quickly. You now have a good sensation that you set a goal and completed it. Good work. But guess what? Your body as started to warm up. You feel pretty good. You decide to do a bit more. Whatever you do next is extra credit. It doesn't matter what you do. You have already completed your goal. Now you are guilt free and in a fun mode. So you start to work on one of your stances. You practice it and add some strikes. You notice that you feel pretty good and you want to do a bit more. Long story short, you are in a state where you train just for the joy of it. What started out as a 5-minute training session has now turned into 15 minutes, then 30 minutes then an hour. When you finally finish you realize how much you accomplished. The next time you make it to class you will find that you are making progress and getting better. Success builds upon success. It is that one small step every step of the way that counts!!! Rather than feel like you are failing at your perfectionist goals, you have now exceeded your more reasonable goals and are in the process having fun and improving faster than you would have imagined. You don't have to sneak into a bathroom every hour. All you need to do is be creative and take advantage of the resources around you. One of my students uses his wireless telephone headset and gets up from his chair and practices during his numerous teleconference through out the day. Instead of sitting there passively, he mutes his phone and practices some air drills and bridging exercises. I am sure you can think of many opportunities at home, school, or work where you can steal a bit of time to train. Of course, while side training will help you perfect your skills, it is still essential to come to class. It is only through interactions with other students and your instructors that your techniques can be critiqued, adjusted and perfected. With the time you make to train during the week by yourself, your progress will be steady and you will be amazed at how fast you progress. I Hope this helps, I will see you in the next article in my blog. 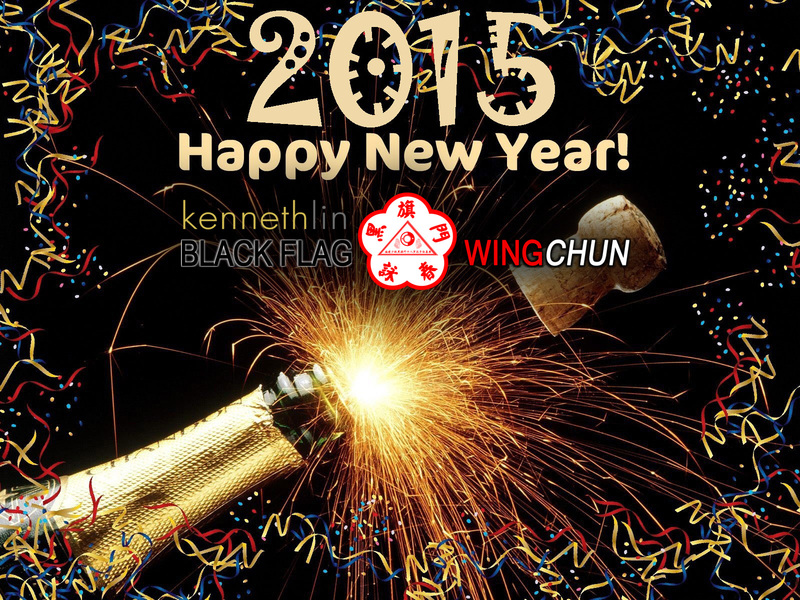 Be Sure to Check out other Articles and Video Demonstration and Tutorial of Black Flag Wing Chun! Don't forget to SHARE and LIKE this articles to your students and friends! 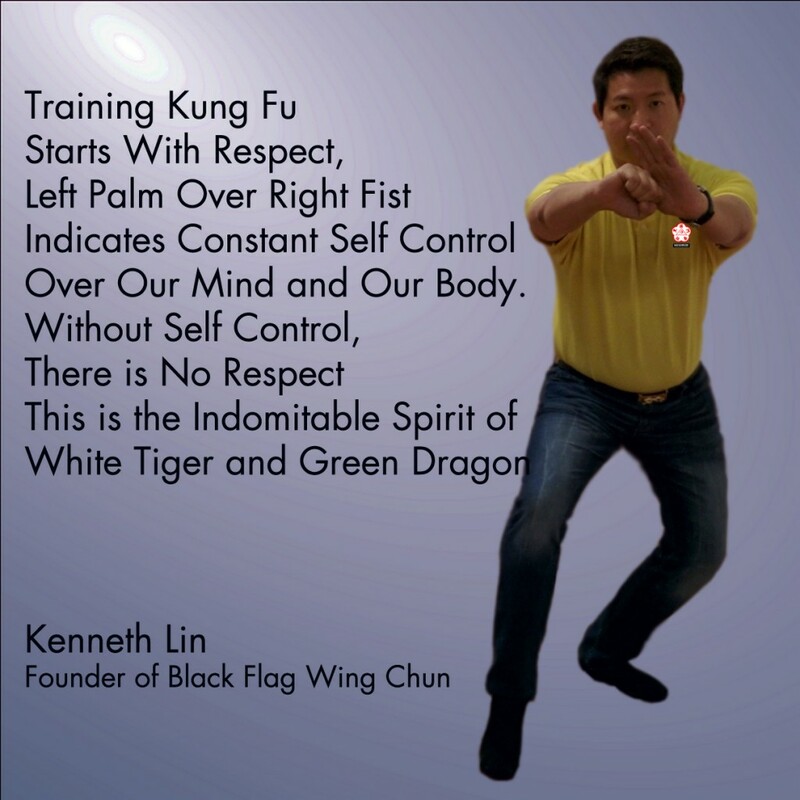 Kenneth Lin, founder of the official Hek Ki Boen Association, is an internationally recognized Grand Master. 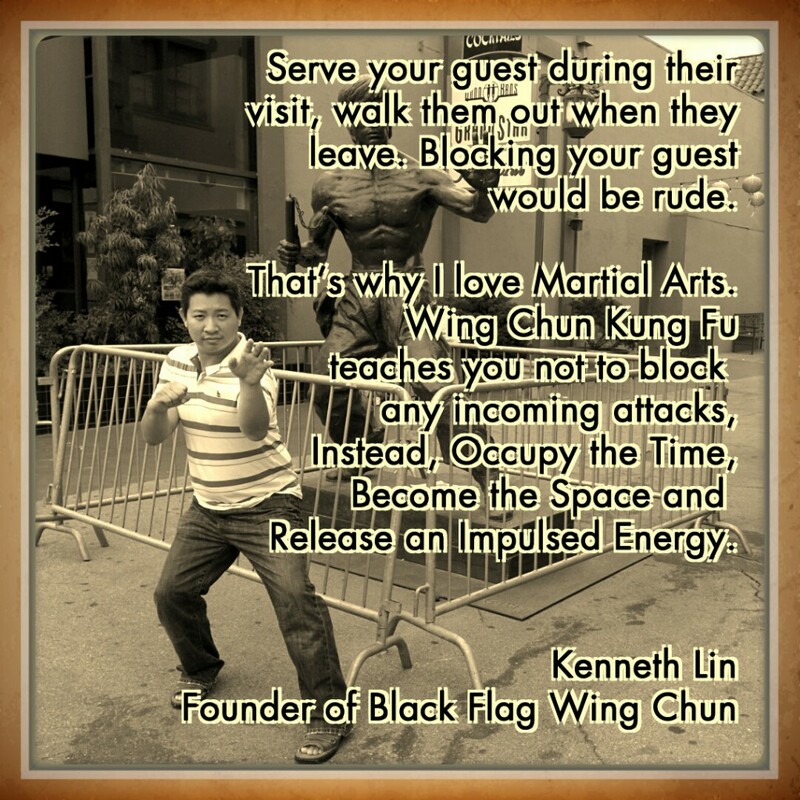 Through his research toward the teaching of GM Tjia Fun Tjia, Last chief martial arts of Black Flag lodge in Fujian who fled to Indonesia in 1907, GM Kenneth Lin compiled, filtered and revived the original teaching of GM Tjia Fun Tjiao of Black Flag system into today's Black Flag Wing Chun. Through his efforts, sincere practitioners on four continents have had the opportunity to benefit from this unique System. To safeguard the integrity of this specialized information, Grand Master Lin established the Association to train, certify and license professional Martial Arts Instructors worldwide, who wish to be a part of carrying this information into the future by passing on this system. 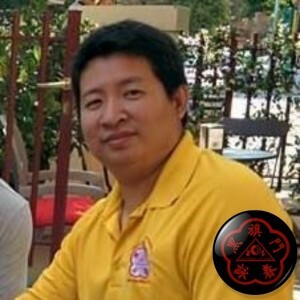 Sifu Kenneth Lin has been called “the world's most practical teaching expert” for consistently delivering real-world results to highly skilled Martial Artists and Instructors. He regularly gives interviews, public workshops and seminars, as well as traveling to teach, test, and certify Masters and Instructors around the world. One of the fastest-growing Systems in the world, HKB has expanded in many countries and now has certified Instructors in North and South America, Asia and Europe. Suhu Lin not only works continually to preserve and promote his Art, but also to advance it, by introducing new innovative approaches to training methodology. His direct, humorous, engaging teaching style has participants -- from beginner to advanced -- smiling, learning and training harder than they ever thought possible. 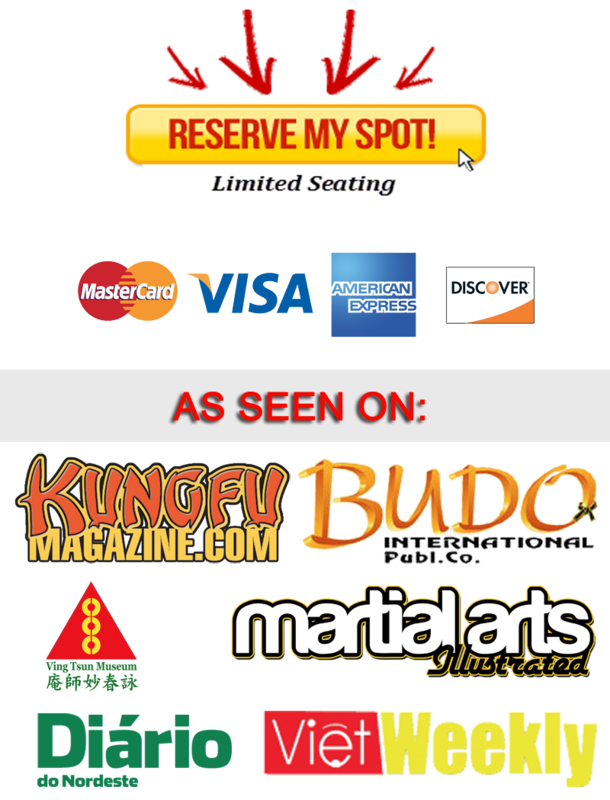 Once HKB was brought out to the public, other Martial Arts organizations, sifus and instructors, both from Wing Chun and from other styles, have come to discover HKB's uniqueness for themselves. Many have found HKB to be a Treasure so valuable, that they too, want to help preserve, promote and teach it.